Water Footprint Awareness Raising for GCC and Arab Countries by AWARENET – 19 October 2014, Muscat, Oman. 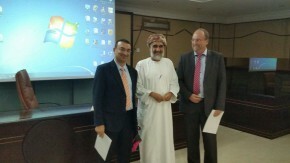 AWARENET, the Arab Integrated Water Resources Management Network, a Cap-Net Regional Network for Capacity Development in Sustainable Water Management hosted by UN ESCWA, jointly with the Oman Water Society (OWS), the Water Science and Technology Association (WSTA), the United Nations Economic and Social Commission for Western Asia (UN ESCWA) and Cap-Net UNDP held the first Training Course on “Water Footprint Awareness Raising for GCC and Arab Countries” on 19 October 2014 in Muscat, Oman. This course was organised as a pre event programme for the Water Sciences and Technology Association (WSTA) 11th Gulf Water Conference (GWC). This course was designed for professionals in the water and environmental sectors in GCC and Arab countries interested to learn about water footprint assessments for their daily practice. The training course was attended by primarily AWARENET members including water managers, government officials, and researchers and representatives from universities and non-governmental organizations involved in water and environmental management in GCC and Arab countries. Supported by the Oman Water Society (OWS), nearly 30 participants mainly from Oman and other GCC and Arab countries learned about Water Footprint Assessment concepts and methodology, how to implement Water Footprint Assessments and from case studies. The training was facilitated by Dr. Mohamed Abdel Raouf from the Gulf Research Centre who attended the 2013 Cap-Net UNDP Training-of-Trainers for Water Footprint assessments. The training was based on the material of the Water Footprint Network (WFN) that was made available through cooperation between WFN and Cap-Net UNDP. AWARENET is currently planning to hold a full scale, certified three days training course on Water Footprint Assessments with partners in the GCC or Arab region in 2015. For this AWARENET can rely on a pool of five certified trainers for Water Footprint Assessments from the Arab region. For more information, please contact AWARENET coordinator, Dr. Ralf Klingbeil at awarenet-escwa@un.org.